The times of refreshing are at hand as I refresh you. I will refresh you with new and vital purpose. I will refresh you with a new vision. I will refresh you and rejuvenate you with new strength. I Am downloading into you with a new and living faith and confidence in ME that will further you in your destiny with ME. YES, with ME, says the LORD, for as you walk in Me and with Me, there is nothing that will be unattainable for you that I author. NOTHING! 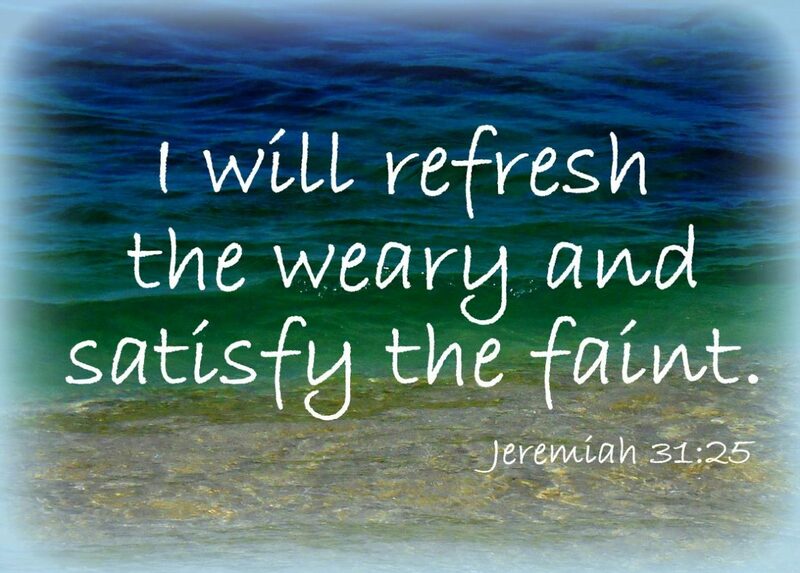 Come into My presence and receive of ME this day and be refreshed. I will cause your heart to sing a new song of praise and I will give you a new freedom in worship. As you do so, you will find new liberty in LIFE and the lightness of My burden, and the ease of My yoke. It has been laborious for you. It is time to rest in Me and shift what you can do and cannot do onto Me, a WILL DO GOD. I can do all things. You can do all things through Me that strengthens you. This is a season of fresh anointing. A refresh new start. A fresh strength and NEW VITALITY, says the LORD. As I refresh you in My presence, I Am preparing the path before you. Do not even consider it. Come into My presence where your joy will be full. Come and dine at My table and eat of the blessings upon blessings that you didn’t even anticipate. I have nothing there that I ordinary or mundane. You can do that for yourself. You do no need Me to provide the mundane and the boring and the same old things. I make all things new in this time of refreshing. Nothing stale or wormy about the fresh new manna that I have prepared for you in My presence. Nothing about My presence that will not thrill you and restore life to you. Come in. Refresh yourself in ME, for it is in this alignment with Me that you will enjoy everything that I have for you. It is your connection with Me that will empower you to do all things well, even as I do. Get refreshed and filled with My Spirit and life, and partake of the newness that I have prepared for you. Cast off those old and heavy weights and unburden yourself and breathe in the new life giving breath of My Spirit and be refreshed and renewed in Me, says the LORD.